Druidry has a history that goes far into the distant past and there are many different opinions about its origins and core practises. Much of the knowledge of what the original druids believed and did has been lost, and there have been many different attempts to try to reconstruct and reinvent druidry for modern times. This makes it a complicated subject. Scholars or pagans wanting to find out the truth about druids are faced with the arduous task of sifting through information from various historical sources and weighing up the value of books written in more recent centuries, which often contain contradictions or inaccuracies. When druid and writer Luke Eastwood got sick of having vast numbers of treatises open around him every time he wanted to research a particular aspect of the pagan path, he decided to write his own book containing everything you could ever want to know about druidry. He called it The Druid's Primer and it has just been published by O-Books under its Moon Books imprint. O-Books says on its website that The Druid's Primer is: "Perhaps the first serious attempt to collate the vast body of druidic knowledge from verifiable ancient sources and Celtic survivals into one usable and practical volume as a handy reference for druids and a learning tool for the would be druid. Inspired by the medieval Irish Scholars Primer this work is the culmination of 15 years research and practical exploration of what it means to be a druid in a modern context." You might think that a book containing so much information would be a weighty tome. In actual fact it is only about 300 pages long. Luke Eastwood has done a remarkably good job of condensing a huge amount of information into this single book. The first chapter looks at the history of Druidry, explaining what can be gleaned from the scant sources that survive from ancient times. I would have to say that I found this bit just a little dry - as history books can sometimes be - but it is still worth reading if you want to know the real truth about the pagan past. The later chapters get far more practical and considerably less dry. Subjects covered include Irish and Welsh gods and goddesses, myths and legends, the cosmological view of the druids, the importance of inspiration - including visualisation exercises, animism, the cycles of the sun and moon with suggestions for rituals to celebrate seasonal festivals, the use of magical tools, divination systems - including a comprehensive section on the ogham, medicine and healing, and wisdom and justice. For me as a Wiccan, whose only experience of druidry has been a few workshops, talks and rituals over the years, reading The Druid's Primer has been an invaluable way of learning more about what druids do. 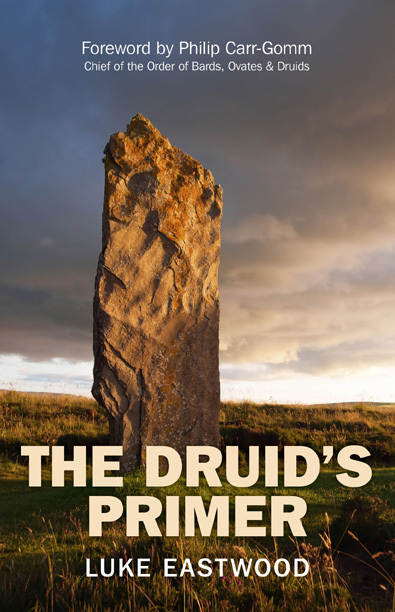 If you want a single book on druidry that covers both the history and modern approaches to this pagan path, then this book by Luke Eastwood could well be what you are looking for.